When your students are working on Education Perfect in class, you can track their progress and make sure they are focusing on the task at hand. Education Perfect provides a live feed of activity for teachers to monitor while students are working on tasks, which helps teachers keep on top of any distractions or issues students may experience while using devices in a classroom setting. First, you'll need to set up a task for your students to work on in class. 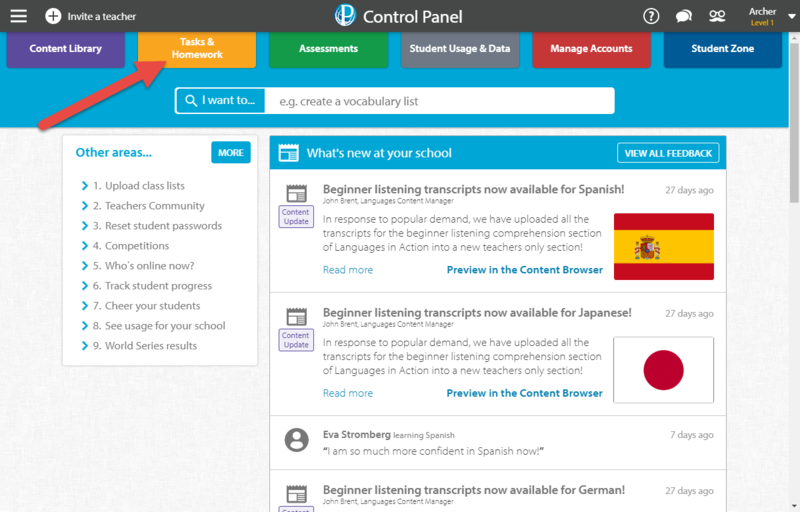 Once this has been done, navigate to the Tasks and Homework section of your Control Panel. 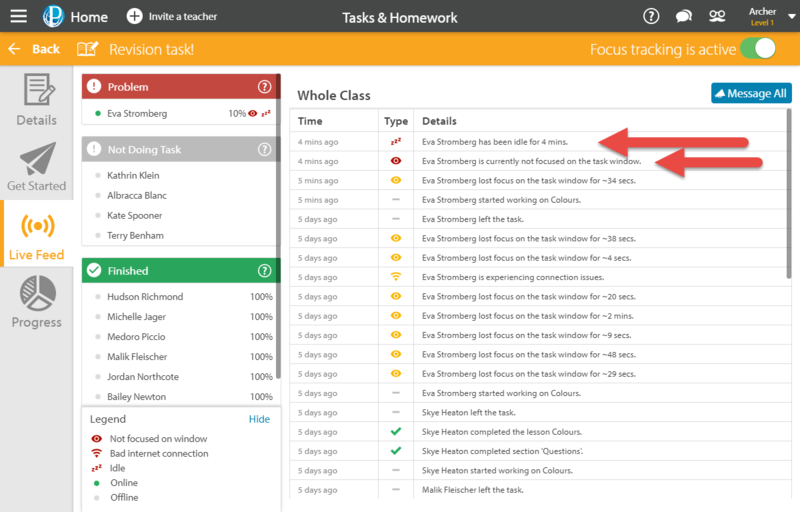 If you don't assign a task to your students, you won't be able to make use of these focus tracking features. Mouse over your task and select the Live Feed option. The Live Feed is where you can see how your students are progressing with the task, and keep an eye on any possible distractions. On the left side you can see the students who are experiencing problems, and the students who are on track or not doing the task, as well as their completion of the assigned material. 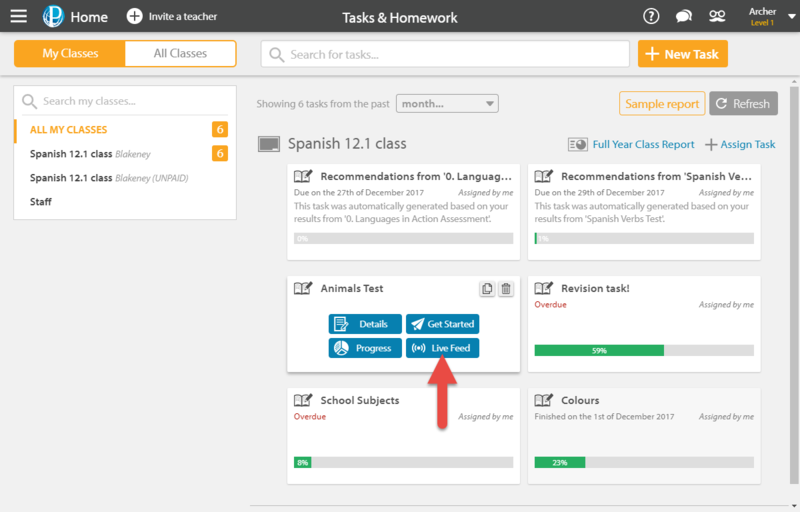 In the top right corner of the picture below, we can see a toggle with the description Focus tracking is active - while this is enabled, the students will receive a friendly warning when they go off task. As the students progress through the task, notifications about their completion will also appear in the live feed, letting you know they are actively progressing through the task. We can also see Eva Stronberg is listed as 'currently not focused on the task window', and has been idle for 4 minutes. This means they have clicked away from the Education Perfect window and have not worked on the task for 4 minutes. The friendly warning consists of a flashing reminder in the name of the browser tab and will display only when the students have navigated away from the task at hand. This should be easily visible to the students.